Background: Previous study showed that an aqueous extract of Bixa orellana L. (Family of Bixaceae) leaf (AEBO) is capable of inhibiting bradykinin (BK)-induced inflammation in animal models. 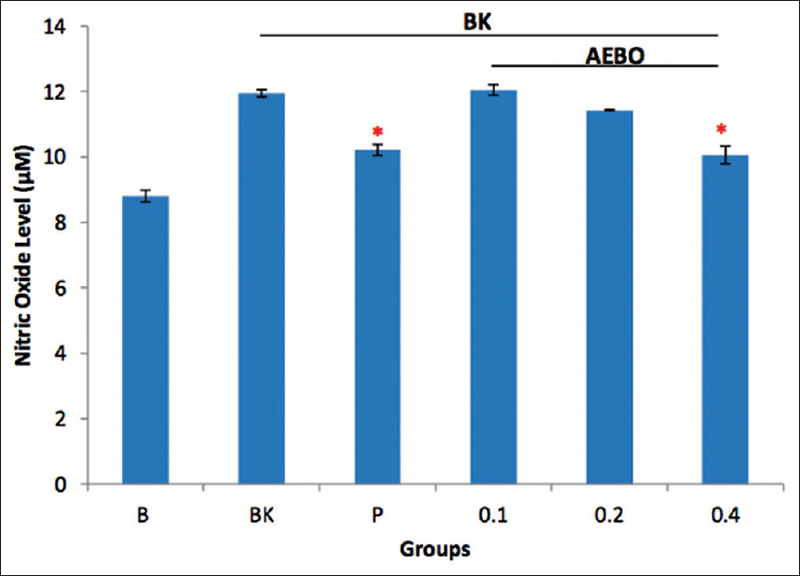 Objective: This study further investigates the effect of AEBO on BK-induce inflammation in vitro model. Materials and Methods: The endothelial barrier protective effect of AEBO was examined via an in vitro endothelial permeability assay. Human umbilical vein endothelial cell (HUVEC) was first pretreated with AEBO with a concentration range from 0.1, 0.2, and 0.4 mg/mL and then induced with BK. Fluorescein isothiocyanate-conjugated-dextran was used as an indicator of permeability flux. To elucidate its mechanism of action, the phospholipase C (PLC) – nitric oxide (NO) – cyclic guanosine monophosphate (cGMP) signaling pathway and protein kinase C (PKC) activity were evaluated. Results: Pretreatment of AEBO significantly (P < 0.05) suppressed BK-induced HUVEC hyperpermeability and 0.4 mg/mL possessed the maximal inhibitory effect (87%, 70%, and 57% inhibition rate at 5, 15, and 30 min time point, respectively). Moreover, AEBO has presented remarkable IC50 = 0.24 mg/mL for anti-PLC activity, 0.36 mg/mL for anti-NO production, and 0.19 mg/mL for anti-cGMP production. For PKC inhibition, the IC50 (0.42 mg/mL) was slightly higher compared to others. Conclusion: This study provided supportive evidence for the previous study where AEBO exhibited anti-inflammatory activity against BK in vivo. The anti-inflammatory activity of AEBO may partly be associated with the reduction of endothelial hyperpermeability via the suppression of PLC-NO-cGMP signaling and PKC activity. Abbreviations used: AEBO: Aqueous extract of Bixa orellana; BK: Bradykinin; PLC: Phospholipase C; NO: Nitric oxide; cGMP: Cyclic guanosine monophosphate; PKC: Protein kinase C; HUVEC: Human umbilical vein endothelial cell; PBS: Phosphate buffered saline; eNOS: Endothelial nitric oxide synthase. The anti-hyperpermeability activity of the extract may partly involve phospholipase C nitric oxide cyclic guanosine monophosphate signaling and protein kinase C activity. Aberrations of endothelial barrier function subsequently increase endothelial permeability, which is one of the most important pathological conditions in the pathogenesis of various inflammatory diseases, including atherosclerosis, cardiac failure, and even cancer formation and metastasis. Number of cytokines and inflammatory mediators, such as vascular endothelial growth factor, reactive oxygen species, histamine, and interferon-γ, are known to increase endothelial permeability. Bradykinin (BK), a vasodilating peptide which is involved in the sensing of pain, also increases vascular permeability. The basis of pharmacological actions of BK is mediated by at least two subtype receptors, designated as B1 and B2: the B1 receptor is undetectable and is usually expressed following inflammation, whereas B2 is constitutively expressed in various types of tissues and mediates many of the actions in physiological condition. Previous studies postulated that the B2 receptor mainly contributed to endothelial hyperpermeability when exposed to BK. This is because selective B2 receptor antagonist showed markedly attenuated reduction in dye leakage from the vasculature., Both receptors are G-protein-coupled receptors, and the activation of the B2 receptor could trigger the phospholipase C nitric oxide cyclic guanosine monophosphate (PLC-NO-cGMP) pathway, which is known as a major signaling pathway. Moreover, BK also upregulates protein kinase C (PKC) activity which is an essential step in endothelial hyperpermeability. Due to the fact that treatment for endothelial dysfunction is still lacking, many researchers are trying to discover new therapeutic options for the prevention and treatment of endothelial inflammation. Our previous studies reported that the extract of Bixa orellana L., also known as “annatto,” has the potential of inhibiting the vascular hyperpermeability induced by different types of inflammatory mediators both in vivo and in vitro.,,, Despite active research, the mechanism of action of B. orellana leaf extract remains largely unknown. Therefore, the aim of this study was to extend the previous in vivo study, and further elucidate the signaling pathway involved in the action of B. orellana leaf extract in BK-induced endothelial permeability. B. orellana leaves were collected from around Universiti Putra Malaysia, Malaysia in the month of July 2014. The plant was authenticated, and the voucher specimen (NL16) was deposited at the Phytomedicinal Herbarium, Institute of Biosciences, Universiti Putra Malaysia, Selangor, Malaysia. Basically, the aqueous extraction method used in the present study was prepared according to the methods described previously and the aqueous extract of B. orellana (AEBO) was from the same batch of the sample from the previous study. BK, HOE140, phosphate buffered saline (PBS) and a ×10 trypsin-EDTA solution were purchased from Sigma Chemical Co. Ltd. Malaysia. 1-(6-[17 β]-3-Methoxyestra-1, 3, 5-trien-17-yl] amino] hexyl)-1H- pyrrole-2,5-dione (U-73122), L-NG-nitroarginine methyl ester hydrochloride (L-NAME), 6-(phenylamino)-5,8-quinolinedione (LY 83583) and GF 109203X hydrochloride were purchased from Merck, Malaysia. Human umbilical veins endothelial cell (HUVEC) and its growth media (M 200) supplemented with a low-serum growth supplement were purchased from Cascade Biologic (Portland). The cultures were maintained at 37°C and 5% CO2. Only cells from passages 1–5 were used in the experiments. In vitro vascular permeability Assay kit (Chemicon® US, in 24-well format) was used as described. A 24-well transwell inserts were coated with collagen, and HUVEC were seeded at 1 × 106 cells/mL and culture until the formation of an integrated cell monolayer. An integrated cell monolayer was verified by microscopic monitoring. Cells were pretreated with AEBO at 0.1, 0.2, and 0.4 mg/mL for 12 h before inducing with 1 μM of BK. Permeability was determined by adding fluorescein isothiocyanateconjugated Dextran (FITC-Dextran) to the upper chamber of each well. Readings were taken from the bottom chamber at 5, 15, and 30 min time points using Tecan Infinite M200 spectrofluorometer (Switzerland) (excitation/emission wavelengths of 485/530 nm). HOE 140 (10 μM), a BK inhibitor was used as a positive control. PLC activity was determined by the quantification of inositol phosphate using a commercial IP-One ELISA kit (Cisbio, USA) and the assay procedures were followed as described in previous studies. U-73122 (10 μM), a PLC inhibitor was used as positive control. A concentration of inositol phosphate was calculated from the standard curve which runs together with the sample. NO accumulation (sum of nitrite and nitrate) was used as an indicator of NO production in the cell culture medium by using a nitrite/nitrate assay kit (Roche, Malaysia). The assay protocol was followed as described in Yong et al. L-NAME (10 μM), an endothelial NO synthase (eNOS) inhibitor, was used as a positive control. The total soluble cGMP produced by HUVEC was measured using a cGMP enzyme immunoassay (R and D System, USA) according to the manufacturer's instructions and the procedure put forth by Yong et al. LY 83583 (10 μM), an inhibitor of soluble guanylate cyclase (GC) and of cGMP production was used as positive control. 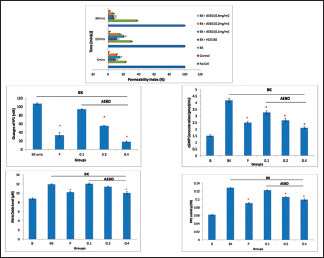 Effect of AEBO on BK-induced PKC activity in HUVEC was determined by an ELISA kit (Enzo Life Sciences, Malaysia). The experiment's protocol was followed as described in Yong et al. GF 109203X hydrochloride (10 μM), a competitive inhibitor of PKC was used as positive control. All experiments were conducted in triplicate, and all values in the figures and test results are expressed as a mean ± standard error of the mean. All data were analyzed using the Statistical Package for Social Sciences (SPSS 22, IBM Corporation, NY, USA). Differences between values were assessed for significance using one-way analysis for variance and further analyzed using Dunnet's test. P <0.05 was considered statistically significant. 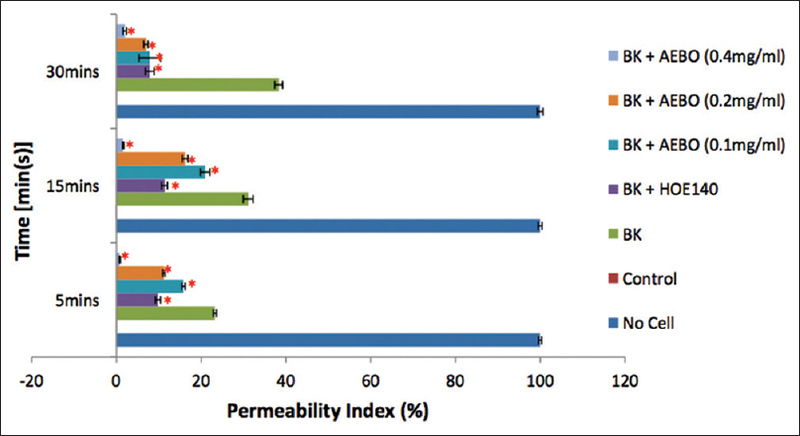 In vitro HUVEC permeability assay result showed that the HUVEC permeability significantly increased after induced by BK when compared with the basal level [Figure 1]. The pretreatment of HUVEC with AEBO suppressed the BK-induced increased permeability in HUVEC at all-time points. Interestingly, AEBO at a concentration of 0.4 mg/mL showed maximal inhibition among all the concentrations (P < 0.05), almost restoring the permeability to the basal level [Figure 1]. HOE 140 also produced significant inhibition (P < 0.05) concerning BK alone group. Furthermore, 0.1 and 0.2 mg/mL of AEBO showed a comparable effect (P > 0.05) with HOE 140. To study the mechanism of AEBO, the PLC– NO– cGMP signaling pathway was examined at cellular level. The production of inositol phosphate was measured to indicate PLC activity in the current study. BK significantly (P < 0.05) increased the production of inositol phosphate, and this indicates that BK elevated PLC activity in endothelial cells [Figure 2]. 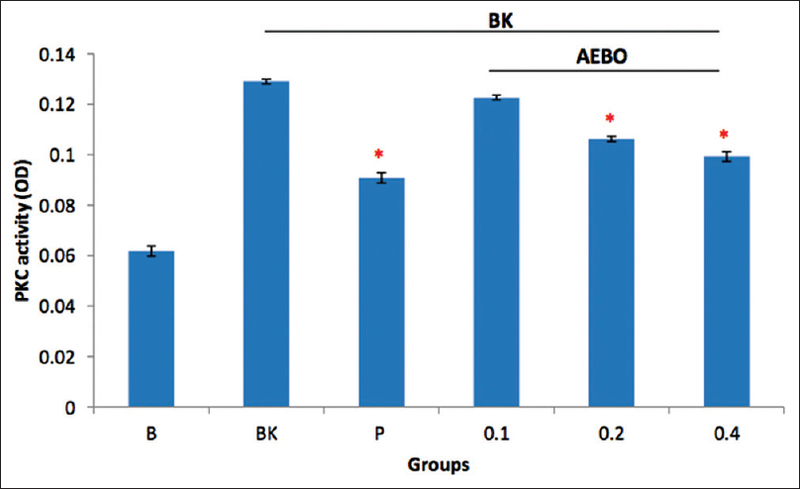 However, pretreatment of the AEBO inhibited BK-induced PLC activity, especially at 0.2 and 0.4 mg/mL. The highest inhibition was produced by 0.4 mg/mL of AEBO with an 82% inhibition rate (P < 0.05). 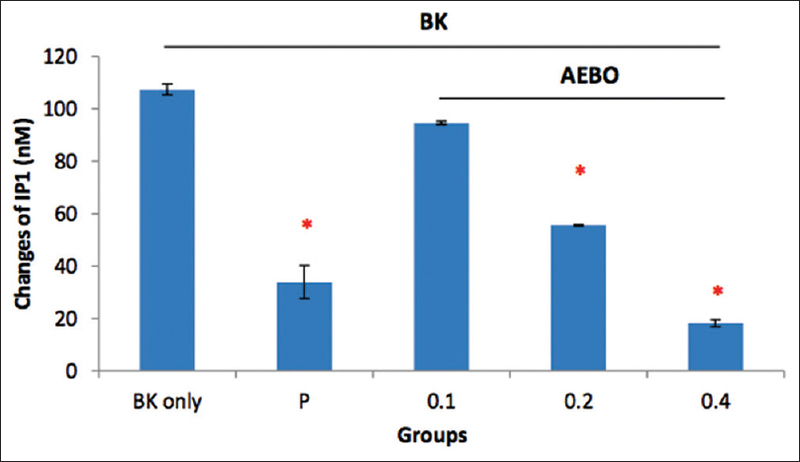 AEBO at 0.1 mg/mL had no effect on BK regulating the endothelial PLC activity, and there was no significant (P > 0.05) difference compared with the BK alone group. 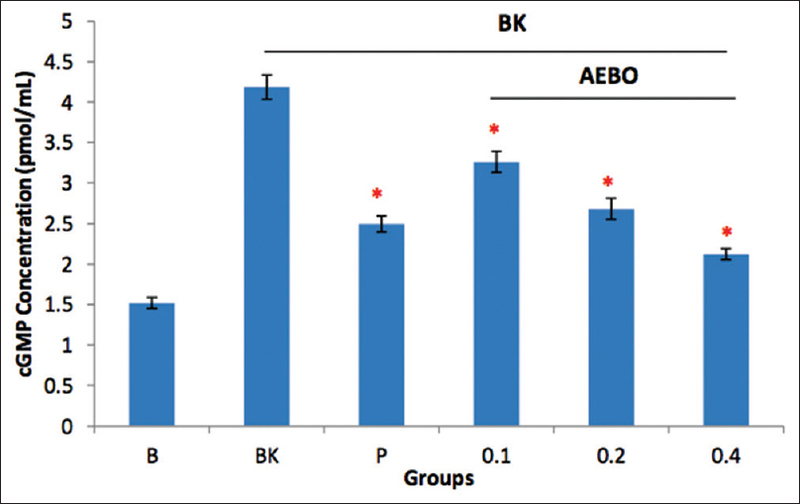 The data revealed that the NO value of L-NAME and 0.4 mg/mL of AEBO significantly decreased (P < 0.05) compared with the BK-only group while that of the BK-only group markedly increased in comparison with the basal group [Figure 3]. On the other hand, pretreatment of HUVEC with 0.1 and 0.2 mg/mL of AEBO failed to suppress the production of NO-induced by BK. cGMP levels in HUVEC was increased significantly (P < 0.05) by BK from the basal level of 1.42 ± 0.01 pmol/mL to 2.74 ± 0.07 pmol/mL [Figure 4]. This increase by BK was inhibited by AEBO in a dose-dependent manner. Maximal inhibition was found at 0.4 mg/mL of AEBO with 77% inhibition rate, while 0.1 and 0.2 mg/mL of AEBO showed 35% and 56% inhibition rates, respectively. The positive control, LY83583, an inhibitor of soluble GC and of cGMP production also showed a significant reduction (P < 0.05) of cGMP level against BK in HUVEC. PKC activity was significantly (P < 0.05) elevated when stimulated with BK in HUVEC [Figure 5]. Preincubation with AEBO at 0.2 and 0.4 mg/mL significantly (P < 0.05) suppressed PKC activity, where the maximal inhibitory rate produced by 0.4 mg/mL was 44% (P < 0.05). However, 0.1 mg/mL of AEBO failed to down-regulate PKC activity given HUVEC exposure to BK. GF 109203X hydrochloride used as positive control showed significant reduction (P < 0.05) in PKC activity compared with BK alone group. A healthy endothelium is important in maintaining vascular homeostasis. Aberrations of endothelial barrier function and vascular hyper-permeability are always associated with numerous detrimental diseases, for instance, hypertension, coronary artery disease, heart failure, or even cancer proliferation and metastasis. Due to its predominant role in the pathogenesis of numerous of diseases, endothelia are an attractive therapeutic target, especially for cardiovascular diseases. There are a number of inflammatory mediators, cytokines, and chemokines that could alter the endothelial barrier function, and thus lead to increase vascular permeability. BK is not only known as a potent vasoactive which elicits pain but it is also potent in increasing vascular permeability. The present data demonstrate that pretreatment of AEBO is capable of suppressing FITC-Dextran across HUVEC when challenged with BK. This result tallies with the previous study where AEBO was shown to reduce the leakage of Evans's Blue dye when the animal was challenged with BK. This again proved that AEBO can suppress the permeability of small blood vessels in an inflamed condition. BK is not only able to increase HUVEC permeability, but it also increases blood-brain barrier permeability, pulmonary vascular permeability, and even increased vascular permeability in ascitic tumors. Previous studies demonstrated that activation of BK subtype 2 receptors (B2) by exogenous BK is contributing to vascular hyperpermeability in animals. However, this pathologic condition was blocked by HOE 140, a highly selective antagonist at the B2 receptor. In our studies, BK significantly increased endothelial permeability; however, pre-treatment of AEBO was shown to markedly attenuate FITC-dextran leakage from the upper to the lower chamber, and the result is comparable with HOE 140. This proves that BK increased endothelial permeability via the B2 receptor because a B2 receptor antagonist inhibited BK-induced hyperpermeability. Thus, AEBO can suppress endothelial hyperpermeability induced by BK, which may be associated with B2 receptor inactivation or inhibition. To elucidate the mechanism of action of AEBO on how to suppress endothelial hyperpermeability induced by BK, the PLC-NO-cGMP signaling pathway was investigated. A number of phosphoinositide-specific PLC isoforms were found to be expressed in HUVEC. The binding of BK to B2 receptors on the surface of endothelial cells will subsequently lead to the activation of PLC and eNOS. This results in the release of NO and also production of cGMP., Interestingly, Aschner and his group reported that endothelial hyperpermeability induced by BK is independent of PLC activation. This contradiction could be explaining by different experimental setting among the researchers. G protein is activated depending on the cell type on which BK exerts its action. In the current study, we measured cellular PLC activity indirectly by determining the level of inositol phosphate produced by endothelial cells when challenged with BK. BK was able to upregulate PLC activity when compared with BK group alone. However, AEBO at 0.2 and 0.4 mg/mL significantly reversed PLC activity by more than 80% (by 0.4 mg/mL). This could suggest AEBO-suppressed endothelial hyperpermeability induced by BK through inhibit PLC activity. NO synthesis by eNOS from the endothelial cells, with a very short half-life free radical participated in the regulating of vascular functions, including vascular tone and blood flow. However, excessive production of NO is always associated with pathologic condition, such as NO produced by macrophages, induced by endotoxins, causing an increase in vascular permeability. A previous study also reported that inhibition of NO production could lead to vascular protein leakage and increased microvascular permeability in animal models. These suggested that NO plays both pro- and anti-inflammatory properties and this depends on the level of NO and “where” it was produced. Extensive studies demonstrated that NO enhanced endothelial permeability in response to BK., This is similar to our current result where BK increased NO production in HUVEC, but this condition was suppressed by the pre-treatment of AEBO. Surprisingly, only 0.4 mg/mL of AEBO significantly reduced the NO level by 50% inhibition rate. This might be due the fact that relatively high concentrations are needed to achieve effective NO inhibition, as eNOS activation can be due to other signaling pathways, such as protein kinase A, Akt, and AMPK. The involvement of AEBO in downstream PLC signaling pathway was further investigated by measuring the level of soluble cGMP. The activation of soluble GC by NO in healthy endothelium leads to the production of intracellular cGMP concentration. This level of cGMP is essential to maintain basal permeability. On the contrary, elevation of cGMP production is associated with increased endothelial permeability, and this had been shown by the current data [Figure 4]. The extensive literature reported that increased endothelial permeability by different inducers occurred through a cGMP-dependent pathway.,, In the experiment done by He, the group even reported that the elevation of cGMP levels using cGMP analogs will transiently increase basal permeability in both frog and rat mesentery microvessels. At the same time, inhibition of the GC using LY-83583 (inhibitor of soluble GC and of cGMP production) attenuated the BK-induced increase permeability in rats. Our current data again showed that the reduction of cGMP level in the BK-induced group and this indicated an elevation of cGMP level is essential to increase endothelial permeability. However, all concentrations of AEBO were capable of suppressing the production of cGMP when HUVEC was induced by BK, with 0.4 mg/mL of the extract showing the highest inhibition rate compared with the rest. All the data suggested that AEBO participates in the suppression of endothelial permeability induced by BK may via PLC-NO-cGMP signaling pathway. Aschner et al. observed that PKC-dependent pathway is required for increased in endothelial permeability induced by BK. On top of that, a finding from Murray et al. also suggested that PKC may mediate increases in vascular permeability in response to BK due to the reason that sphingosine (PKC inhibitor) markedly attenuated responses to BK in an animal setting. In the present study, we observed that BK significantly upregulated PKC activity in vascular endothelial cells, but this was reduced by the pretreatment of AEBO. The reduction is significant; however, inhibition rate is <50% even in the highest concentration (0.4 mg/mL). This may be due to AEBO not being a specific target in PKC activity. Based on the previous GC-MS analysis, the major compound presented in the AEBO is acetic acid and Ruiz and Gomes had documented that low concentration of acetic acid exhibited anti-histamine activity. This could be explained the anti-hyperpermeability effect of AEBO in the current study. Nonetheless, the possibility of the other compounds or minor compounds which are yet discovered in the B. orellana leaves exhibiting anti-inflammatory properties cannot be excluded. Current results are important and contribute toward the validation of the traditional use of this plant in the treatment of inflammatory disorders. In addition, it could be also a potential therapeutic agent to treat vascular hyper-permeability-related diseases. The present data has shown that AEBO plays an inhibitory role in vascular inflammation, especially vascular permeability. It was clarified that AEBO suppresses BK-induced endothelial hyperpermeability via inhibiting the PLC-NO-cGMP pathway. However, the molecular mechanism including receptor identification of AEBO involved remains to be clarified and is a very attractive future target. This project was supported by the Fundamental Research Grant Scheme (Project No. 04-01-07-100FR) from Ministry of Higher Education, Malaysia. Kumar P, Shen Q, Pivetti CD, Lee ES, Wu MH, Yuan SY. Molecular mechanisms of endothelial hyperpermeability: Implications in inflammation. Expert Rev Mol Med 2009;11:e19. Sivaraj KK, Li R, Albarran-Juarez J, Wang S, Tischner D, Grimm M, et al. Endothelial Gαq/11 is required for VEGF-induced vascular permeability and angiogenesis. Cardiovasc Res 2015;108:171-80. Craige SM, Kant S, Keaney JF Jr. Reactive oxygen species in endothelial function – From disease to adaptation. Circ J 2015;79:1145-55. Ashina K, Tsubosaka Y, Nakamura T, Omori K, Kobayashi K, Hori M, et al. Histamine induces vascular hyperpermeability by increasing blood flow and endothelial barrier disruption in vivo . PLoS One 2015;10:e0132367. Ng CT, Fong LY, Sulaiman MR, Moklas MA, Yong YK, Hakim MN, et al. Interferon-gamma increases endothelial permeability by causing activation of p38 MAP kinase and actin cytoskeleton alteration. J Interferon Cytokine Res 2015;35:513-22. Ishihara K, Kamata M, Hayashi I, Yamashina S, Majima M. Roles of bradykinin in vascular permeability and angiogenesis in solid tumor. Int Immunopharmacol 2002;2:499-509. Marceau F, Regoli D. Bradykinin receptor ligands: Therapeutic perspectives. Nat Rev Drug Discov 2004;3:845-52. Blaes N, Girolami JP. Targeting the ‘Janus face’ of the B2-bradykinin receptor. Expert Opin Ther Targets 2013;17:1145-66. Wirth K, Hock FJ, Albus U, Linz W, Alpermann HG, Anagnostopoulos H, et al. Hoe 140 a new potent and long acting bradykinin-antagonist: In vivo studies. Br J Pharmacol 1991;102:774-7. Hock FJ, Wirth K, Albus U, Linz W, Gerhards HJ, Wiemer G, et al. Hoe 140 a new potent and long acting bradykinin-antagonist: In vitro studies. Br J Pharmacol 1991;102:769-73. Aschner JL, Lum H, Fletcher PW, Malik AB. Bradykinin- and thrombin-induced increases in endothelial permeability occur independently of phospholipase C but require protein kinase C activation. J Cell Physiol 1997;173:387-96. Yoke Keong Y, Arifah AK, Sukardi S, Roslida AH, Somchit MN, Zuraini A. Bixa orellana leaves extract inhibits bradykinin-induced inflammation through suppression of nitric oxide production. Med Princ Pract 2011;20:142-6. Yong YK, Sulaiman N, Hakim MN, Lian GE, Zakaria ZA, Othman F, et al. Suppressions of serotonin-induced increased vascular permeability and leukocyte infiltration by Bixa orellana leaf extract. Biomed Res Int 2013;2013:463145. Yong YK, Zakaria ZA, Kadir AA, Somchit MN, Ee Cheng Lian G, Ahmad Z. Chemical constituents and antihistamine activity of Bixa orellana leaf extract. BMC Complement Altern Med 2013;13:32. Yong YK, Chiong HS, Somchit MN, Ahmad Z. Bixa orellana leaf extract suppresses histamine-induced endothelial hyperpermeability via the PLC-NO-cGMP signaling cascade. BMC Complement Altern Med 2015;15:356. Oakley R, Tharakan B. Vascular hyperpermeability and aging. Aging Dis 2014;5:114-25. Golias Ch, Charalabopoulos A, Stagikas D, Charalabopoulos K, Batistatou A. The kinin system – Bradykinin: Biological effects and clinical implications. Multiple role of the kinin system – Bradykinin. Hippokratia 2007;11:124-8. Ehringer WD, Edwards MJ, Miller FN. Mechanisms of alpha-thrombin, histamine, and bradykinin induced endothelial permeability. J Cell Physiol 1996;167:562-9. Easton AS, Abbott NJ. Bradykinin increases permeability by calcium and 5-lipoxygenase in the ECV304/C6 cell culture model of the blood-brain barrier. Brain Res 2002;953:157-69. Breil I, Koch T, Belz M, Van Ackern K, Neuhof H. Effects of bradykinin, histamine and serotonin on pulmonary vascular resistance and permeability. Acta Physiol Scand 1997;159:189-98. Liu LB, Liu XB, Ma J, Liu YH, Li ZQ, Ma T, et al. Bradykinin increased the permeability of BTB via NOS/NO/ZONAB-mediating down-regulation of claudin-5 and occludin. Biochem Biophys Res Commun 2015;464:118-25. Félétou M, Bonnardel E, Canet E. Bradykinin and changes in microvascular permeability in the hamster cheek pouch: Role of nitric oxide. Br J Pharmacol 1996;118:1371-6. Cruden NL, Newby DE. Therapeutic potential of icatibant (HOE-140, JE-049). Expert Opin Pharmacother 2008;9:2383-90. Lo Vasco VR, Pacini L, Di Raimo T, D'arcangelo D, Businaro R. Expression of phosphoinositide-specific phospholipase C isoforms in human umbilical vein endothelial cells. J Clin Pathol 2011;64:911-5. Dobrivojević M, Špiranec K, Sinđić A. Involvement of bradykinin in brain edema development after ischemic stroke. Pflugers Arch 2015;467:201-12. He P, Zeng M, Curry FE. CGMP modulates basal and activated microvessel permeability independently of [Ca2+]i. Am J Physiol 1998;274:H1865-74. Moraes MS, Costa PE, Batista WL, Paschoalin T, Curcio MF, Borges RE, et al. Endothelium-derived nitric oxide (NO) activates the NO-epidermal growth factor receptor-mediated signaling pathway in bradykinin-stimulated angiogenesis. Arch Biochem Biophys 2014;558:14-27. Kubes P, Granger DN. Nitric oxide modulates microvascular permeability. Am J Physiol 1992;262:H611-5. Lo Faro ML, Fox B, Whatmore JL, Winyard PG, Whiteman M. Hydrogen sulfide and nitric oxide interactions in inflammation. Nitric Oxide 2014;41:38-47. Mayhan WG. Role of nitric oxide in modulating permeability of hamster cheek pouch in response to adenosine 5'-diphosphate and bradykinin. Inflammation 1992;16:295-305. Bir SC, Xiong Y, Kevil CG, Luo J. Emerging role of PKA/eNOS pathway in therapeutic angiogenesis for ischaemic tissue diseases. Cardiovasc Res 2012;95:7-18. Kubes P. Nitric oxide-induced microvascular permeability alterations: A regulatory role for cGMP. Am J Physiol 1993;265:H1909-15. Mayhan WG. VEGF increases permeability of the blood-brain barrier via a nitric oxide synthase/cGMP-dependent pathway. Am J Physiol 1999;276:C1148-53. Wong D, Dorovini-Zis K, Vincent SR. Cytokines, nitric oxide, and cGMP modulate the permeability of an in vitro model of the human blood-brain barrier. Exp Neurol 2004;190:446-55. Murray MA, Heistad DD, Mayhan WG. Role of protein kinase C in bradykinin-induced increases in microvascular permeability. Circ Res 1991;68:1340-8. Ruiz CM, Gomes JC. Effects of ethanol, acetaldehyde, and acetic acid on histamine secretion in guinea pig lung mast cells. Alcohol 2000;20:133-8.